Showing results for tags 'Firebrick'. Hello folks, this is my first post on here. To give you a quick background: I don't have much internet access (phone only for now) so excuse me if I've missed other threads with similar specifications. Up to now I've only worked with coal forges, but due to my recent move, it won't be possible to run coal SO I've decided to build a gas forge. I've seen tons of options on here concerning size, shape, and number of burners. Now I don't know exactly what info you need to answer my questions, but I work with mostly round and square stock from 1/2" to 1", and do lots of scroll bending and twisting. With my current forge I am working with up to 12" of material at a time with multiple pieces in the fire because sometimes I have more than one person working in the shop. Here is my plan so far: I have a surplus of 8"x8"x10" refractory blocks. I will be cutting them in half to use as my lining. I also plan to build frosty's T burner plan as the burner(s). My questions are A) how many burners should I run and B ) how big should I build the forge? Thanks in in advance for any input. 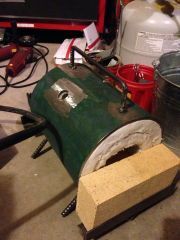 Homemade propane forge constructed from condemned oxygen cylinder. Length is approx 11". Lined with one inch layers of kaowool x 2. Rebar legs and carry handle. I'm up in Vermont for a for weeks at my parents' place, and thought I would build a small side-draft charcoal forge. We've got a bunch of firebrick that have been sitting out in a field, and they are very wet and moldy. Do any of you guys know whether they're ok to use?